Microsoft Office 365, the subscription service that gives users access to the latest Microsoft Office software, is coming to the Mac App Store for the first time, allowing Mac and MacBook owners to quickly and easily access Word, Outlook, Excel and other apps separately, or as an entire suite. Subscriptions can also now be bought within the apps, so you can start using them straight away (you need a subscription in order to use Microsoft 365 apps). These apps have been available for Mac, but previously you'd have to download the full program from the internet, or buy a boxed copy. Now that Office 365 will be available on the Mac App Store, buying and installing the applications will be far more convenient for many Mac users. 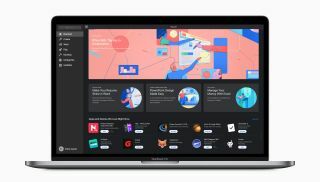 Perhaps most interestingly, Office 365 for Mac comes with features that have been specifically designed for Macs, such as compatibility with macOS Mojave’s Dark Mode and Continuity Camera, which lets you use an iPhone (or iPad) to scan documents or take photos, with the images appear instantly in an Office document on your Mac. Office 365 for Mac will also support MacBooks with Touch Bars, and these Mac-specific features show that this isn’t a simple slapdash port to Mac devices. For anyone who's used Microsoft Office on a Mac in the past, this will be good news, as it looks like this could be the best fusion of Microsoft software and Apple hardware yet. There are some useful features for enterprise users as well, as the Office 365 apps in the Mac App Store can be remotely distributed to employees using Apple Business Manager, which is a central dashboard used by IT departments to deploy apps and licenses on employee Mac devices. We’ll update this story as soon as we hear more about when Office 365 will be available on the Mac App Store, as well as pricing details.